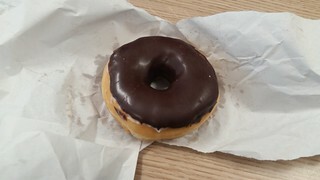 I was shocked and appalled this morning, when I bought a doughnut from the local bakery. The doughnut cost £1.05. I wasn’t trying to buy cocaine! I wanted a doughnut. Life under the Tory government. After a very busy week at work, I was hoping for a restful Bank Holiday weekend. What I got was far from relaxing. I was out of the house every one of the three days. I’ve returned to work for a break! Saturday was the quietest day. 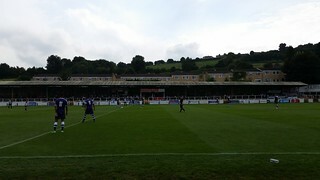 I went to Twerton Park, home of Bath City, where I will no doubt find myself standing in all manners of weathers and temperatures over the next eight months. City were playing East Thurrock United. If that name sounds familiar to you, it is because I have blogged about them before. They beat us 7-1 in the FA Cup. Things looked ominous. I needn’t had worried. A very early goal for City helped us win 2-1, albeit with a nervy final few minutes. 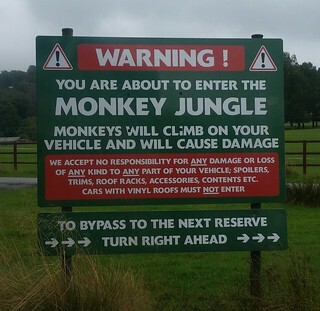 On Sunday we made our now annual trip to Longleat. We were stupid to do so. It was a Bank Holiday weekend, which meant two things – lots of people and lots of rain. We got both. 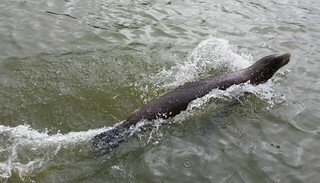 In between sessions of queueing in heavy rain, we did manage to ride the boat around the lake, where we saw sea lions and gorillas. Apparently hippos are in there somewhere too, but I didn’t see any. As well as the boat, we rode a double decker bus around the safari park. Many of the animals had shown more sense than us and taken shelter from the rain. 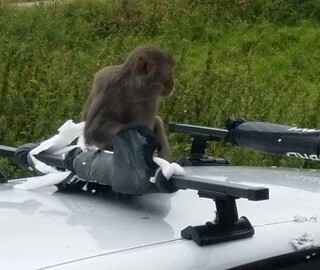 The monkeys, however, were out in their numbers, and caused the highlight of the day for me, when they destroyed a roof rack of car, and attempted to eat a radio aerial on another. 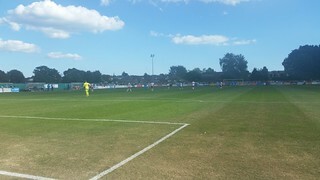 We took a trip to the Dorset coast on Bank Holiday Monday, to watch Bath City play Poole Town. I didn’t get chance to see the donkeys on the beach, so had to settle for watching them on the football field instead. It was a game Bath really should have won, as they dominated and literally did everything but score a goal. I wasn’t at all surprised when Poole scored in the final minute, to claim an undeserved win. It was so inevitable, I wasn’t even disappointed. Despite the warm weather, the coach trip home didn’t have the unbearable heat of the Margate journey, a few weeks earlier – this was mainly thanks to the driver turning on the air conditioning. It also took have as long to get back to Bath, which meant we were able to treat ourselves to a McDonalds on our return. It is the first day of September, which means different things for different people. For some, the start of September spells the end of summer. For others, the kids going back to school. The football transfer window closed yesterday too. However, for me, September means one thing… spiders. I am sure they have a calendar and as soon as the month begins, all decide to invade our homes – supposedly to mate, but more likely to scare me. Roll on October, when they disappear again, or die in the cold. Until then, I am going to live in an air-tight box, so no eight-legged being can make contact with me.